It is now the first of the month. As such, it is time for me to back up our PCs. Awhile back, our desktop PC’s hard drive died. On that drive would have been all of our photos of us, NHL, JSL, etc. We could easily have lost everything with no way of replacing it. Luckily, I had long before implemented a backup routine. My first backup plan was burning CD’s with the data. Unfortunately, as the amount of data that we needed to back up grew, the backups became more and more of a pain to do. First, I had to locate all of the files. Then, I had to figure out how best to fit them on CDs. Finally, I had to man the CD burner to take out the old CDs, put in the new ones and check for errors. Eventually, we got a DVD burner but this just temporarily lightened the load. Soon we needed to back up multiple DVDs every month. After researching various solutions, I hit upon a cure. We bought two external hard drives, each 1TB in size. All of our data was backed up to one of the drives. The data on that drive was then backed up to the second drive. While the first drive would remain at home (for easy data access), the second drive would be moved to an “undisclosed offsite location.” This way if our house were burgled or burned to the ground, our data would survive. In addition, we’re protected against a single drive just up and dying. Recently, a few companies began offering “cloud” backup services. You pay a monthly (or yearly) fee and get a certain amount of space to store your files. This might work nicely for a few important documents (and, in fact, I’ve been known to import important documents into Google Docs for quick access and guaranteed backups), but try backing up 10GB of new files to the cloud. Worse yet, try restoring 200GB of files from the cloud to your PC. Besides, while Amazon Cloud Drive (to pick a service at semi-random) costs $200 per year for 200GB of space, two 1TB external hard drives cost about $120. A $120 one-time cost beats a $200 recurring fee any day of the year. 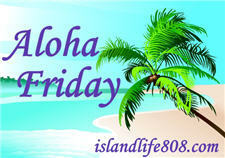 My Aloha Friday question for today is: How do you backup your important files? Also, how often do you back up? My computer crashed not long ago. I was able to do a recovery and got all my photos backed up onto DVDs. I had 35GB on there. Soon after I found a 1.5TB external for $60! I couldn’t pass that up so now everything is stored there as well as the DVDs I had already burned. I was sick thinking I lost everything. I had Madi’s whole life in there. I also upload a lot of my photos to Flickr and Facebook. Which is nice to have there as well. I back up once a week, although I should probably do it more often. I have an external back up drive.